As tributes to actor Om Puri poured in, a headline describing him as “an actor who did not get his due” struck me. What would have been construed as his getting “his due”? Who would have given it? Can the issue — why some actors do not get their “due” — be addressed? As I look back on Om Puri’s (that’s how he was always referred to — by his full name rather than Puri or Om or anything else) life, that’s what bothers me. What did his career stand for? How will his contributions be viewed? And must his personal life, sometimes controversial, be part of why he is remembered? Almost every tribute to this versatile actor — and so few mainstream actors in Indian cinema can merit that adjective — has stressed on his immense contributions to Indian “parallel” (read independent) cinema. Indeed Om Puri, along with peers Naseeruddin Shah, Shabana Azmi and Smita Patil, was once seen as one of the quartet that established a new movement in Indian cinema — the parallel movement. That movement, live only in memories now, is still derided by opponents who did not share its values. Of course, it was writers and directors that birthed the movement, and gave it its core — Vijay Tendulkar, Dilip Chitre, Bhisham Sahni, Saeed Akhtar Mirza, Shyam Benegal, Govind Nihalani, Satyadev Dubey, Girish Karnad and many others. But the movement was fleshed out and the memories were created through the agency of those in front of the camera. It was here that Om Puri stood out. Any legacy to his career without understanding his times would be futile. His breakaway “hit” — and yes, it was a commercial success in 1983 — Ardh Satya haunted the memories of middle-class moviegoers across the country — unused to such raw emotion. Nor was the film comfortable — a searing indictment of the effect of the Indian political system and its ganglord-type netas on an honest cop. Impotence, frustration, anger, existential crisis — Anant Velankar (Puri’s character) embodied them with a rare thespian passion and ferocity. Unsurprisingly, Om Puri won awards nationally and internationally. More significantly, the film held up a mirror to the commonly felt angst among many Indians who yearned for a society more closely based on justice and equality and human rights and opportunities. It wasn’t about just the film (and others of the genre). Filmmakers had hoped these qualities would also seep into lived experiences of Indians. They were out to “change India” for the better, even if they did not articulate it quite as bluntly. That movement, so optimistic and possibly naive, had, however, been the life of those involved in it, and its death impacted many of those who formed its core as India’s mainstream (in cinema and otherwise) decided to go a far more corrupt, misogynistic, violence-prone and simplistic way. Om Puri’s own life and career wove in and out of these heady times. He and his compatriots weren’t stars in the conventional sense, but actors who studied their subjects, learnt accents, practised method acting, and above all strove to capture the essence of their characters. Indeed, many of the films of the time were made by cooperative societies comprising those working in the films. To understand just how unlikely a time it would seem from today’s careerist, plastic times, and how different, one just has to look at the list of Hindi films that year. Himmatwala, Coolie, Souten, Hero, Betaab, Nastik, Mawaali, Mahaan and Taqdeer topped the box-office charts. But there was already a movement towards a steady stream of more “realist” cinema, influenced no doubt by international auteur, but addressing local issues. 1983 was special, arguably towards the nadir of the “movement”. Jaane Bhi Do Yaaro, Masoom, Mandi, Katha, Godam and Arohan were the other outstanding attractions that year for an audience splitting from vigilante justice that mainstream dished out — an audience that was not looking for escapist fare and could fill cinema houses. Of course, Om Puri had already wowed this niche audience with Aakrosh (1980), a film where the lack of voice of the Indian poverty- stricken farmers was literally conveyed. The actor has just two speaking lines — one a flashback, and the other a scream. A scream that went on and on, guttural, deep, and earthy, it shook up the audiences who saw the film in theatres. Once again, Om Puri’s Lahanya Bhiku was one of India’s millions of downtrodden, desperate, exploited, victimised and voiceless millions — captured brilliantly on screen. Those caught in headlights of India’s apparent glittering future need only look at this portrayal to see just how an actor can breathe life into a character. What acting entails. How influential acting can be. And why such actors can be burnt out when things don’t go according to plan. 1950-born Om Puri had himself come out of relative poverty. Originally from Ambala in Haryana, his early life had seen some fortuitous chances that led him to Delhi’s National School of Drama in the 1970s, where he really honed his acting skills. A stint at the Film and Television Institute of India (FTII) followed, though he did not even have the money to pay its fees, and anecdotal commentary suggest friends, classmates and staff pitched in. Yes, FTII was still not regarded as the irrelevant institution it widely seen as today, and India’s best and brightest cinematic talents still wanted to go there. Om Puri’s other notable work came during these years — Sadgati, Albert Pinto Ko Gussa Kyoon Aata Hai, Susman, Giddh, Aghaat, Mirch Masala. It didn’t matter to Om Puri, and indeed many of his peers, if the roles were big or small — they were part of a team, and often together, in most of the films made the decade starting from 1973. Indeed, the same year as Ardh Satya, his role as servant Ramgopal in Mandi was relatively minuscule, in a film that had almost all the leading names of the “parallel” genre as its stars. He got some heavy duty roles that will go down as some of the best portrayals of underprivileged Indians. See him as a father/Pochampally master weaver who has no money to marry off his daughter in Susman, as “untouchable” shoemender Dukhi in Sadgati, as Hari Mondal, a poor peasant caught up in the exploitative agricultural system and the Naxalite movement in Arohan, as Madhav Verma, an honest and diligent union representative in Aghaat to realise just why a farmer commits suicide today. Why earlier there was a spate of textile workers’ suicides. To underscore, his common man portrayals of the voiceless Indian could definitely serve as an entire course material at any cinema school. Note his performance as Abu Miyan in Mirch Masala, as Velu, a sugarcane farmer with great faith in the Indian state in Current, or as Kolkata rickshaw puller Hazari Pal in City of Joy (a rare example of a film being better than the book, and Puri played no small role in that). It was widely noted just how much work the actor put in pulling rickshaws in the city’s streets. When during rehearsals, he recited the lines quoted in the beginning, he cried. Escapism? What’s that? Then there was Nathu in Tamas, bringing home political exploitation and manipulation. Political roles came early, from lead roles in Ghashiram Kotwal, to bit parts such as Nahari in Gandhi or Goel in Hey Ram. He got to play the other side too — as landlord Ram Naresh in Paar, as Ajay Singh, an ambitious MLA involved in just about every illegal activity in New Delhi Times and, of course, corrupt builder Ahuja in Jaane Bhi Do Yaaro. Urban roles also came as a cop in the gritty Drohkaal, while playing roles that would be seen as unfavourable or “villainous” was part of the deal. Witness militant Sanatan in Maachis! I almost hoped no one ever gave him such roles, so convincing was he in his incendiary arguments. As Rambaran Manto in Mrityudand, he emerged the unlikely hero in a caste- ridden village. But the writing was also on the wall, and as India took tentative steps towards globalisation in the late 1980s, societal desire for “getting rich fast” had overtaken the “let’s make India a better place to live in”. The arrival of television (equate to today’s social media) played a role in the shifting priorities. By the time Tamas was released in 1987 and Bharat Ek Khoj a year later, the average Indian was discovering the instant gratifications of precursors of Ramayanas and Mahabharatas. The momentary demise of NFDC in 1985, producer of many of the “new wave” films, dealt a serious body blow. Cinema for change fell by the wayside. 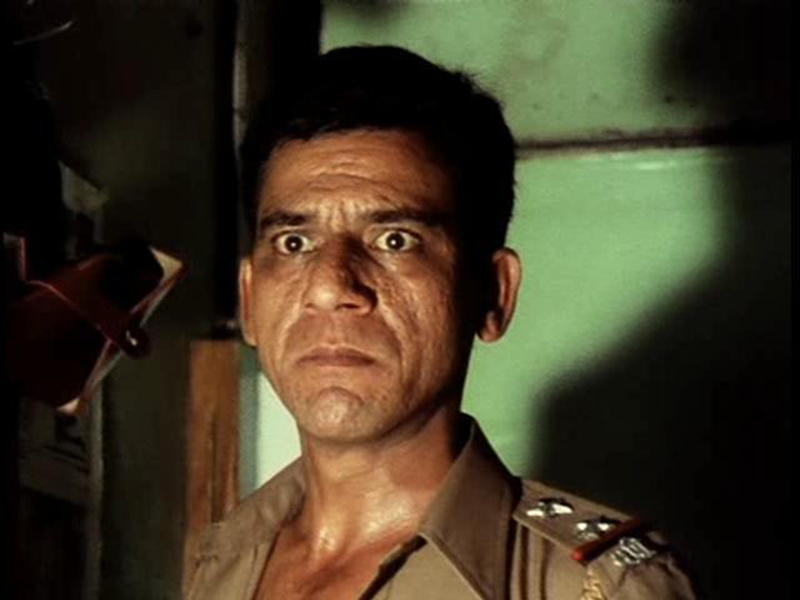 Of course, of late Om Puri has done other roles as well. Starting with Disco Dancer, he soon became a firmament in the commercial Hindi cinema space as well. He has shone in many of these roles too, especially excelling in comic touch in films such as Chachi 420, Malamaal Weekly. Whether in bit parts in films such as Rang de Basanti or in “bold” films such as Aastha, his presence was noted and often appreciated. Of course, his contribution was not limited to Hindi cinema, and his contribution came in films made in various Indian languages — from Kannada and Marathi to Bangla. For years, Om Puri was the top choice for an Indian actor internationally, starting with Jewel in the Crown. Notable roles came as Salford fish-and-chip shop owner George Khan in East is East, and My Son the Fanatic, where he played Pakistan-origin taxi driver Parvez in a UK impacted with religious fundamentalism. Then there was the man of many moods, Ramlogan in The Mystic Masseur. And many other roles, not all memorable though. He was named an Honorary Officer of the British Empire (OBE), while India honoured him with a Padma Shri. On IMDb, Om Puri has 303 acting credits. That’s a vast body of work, and not all of it will have much of a shelf life. But as he himself admitted in an interview, he at least got to work in some great films. He also worked with some of the best names in cinema. Life hadn’t been easy always. He said in an interview that he acted in Jaane Bhi Do Yaaro as there was free food on sets! The film’s director Kundan Shah is on record for saying the role was offered to him at the last moment! for me as an audience member, it was his work that mattered. “Oye, chup oye Arjun Singh.... Draupadi tere akeli ki nahi hai, ham sab shareholder hai” — just one of the moments from his work the actor himself had suggested would be part of his popular legacy. 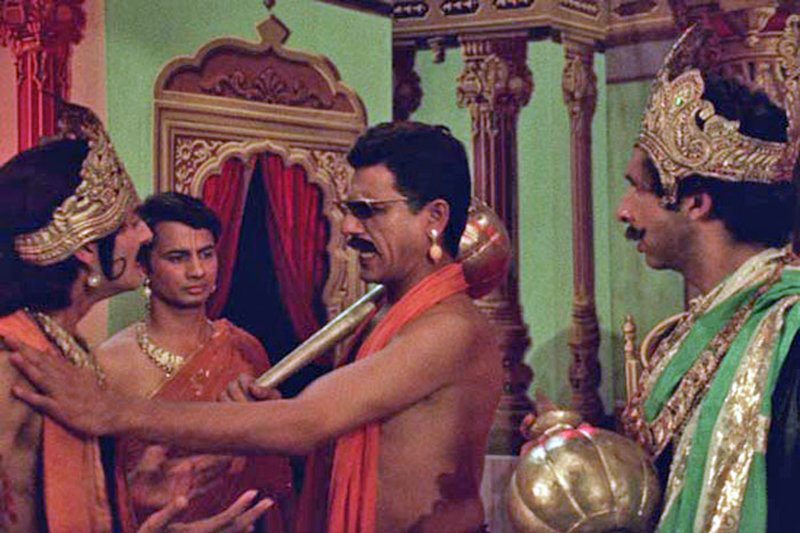 While this “Mahabharata scene” may bring a smile to many, there is more than enough material for serious students of filmcraft too. He may not have got his due when measured in terms of better acting = better pay. I would like to think, however, that among the legions audience members who admired and drew inspiration from his acting, his legacy will be a bright one, oft-cited for its all round excellence.